In the early 1900s, 4-H emerged as the youth programme of the Cooperative Extension Service (CES) in the United States. CES is the agricultural extension programme jointly funded by the United States Department of Agriculture (USDA) and state and local governments through the Land Grant University in each state and territory. 4-H focuses on learning life skills experientially in informal settings. 4-H, and youth development education programmes modelled on it, may be found on every populated continent. In 1986, the USDA extension service funded Ohio State University and Mississippi State University to identify and define the areas of knowledge and research that 4-H youth development programmes are based on. The 4-H Professional Research and Knowledge (4-H PRK) base taxonomy was first defined in 1987 (Table) and included the interdisciplinary application of knowledge areas that help a professional to design, implement and evaluate informal experiential education programmes for youth. It included five subspecialities or domains: communication, educational design, youth development, youth programme management, and volunteerism. The taxonomy established a framework for cataloguing and accessing research and knowledge sources relevant to the practice of 4-H youth work. In partnership with the National Association of Extension 4-H Agents, the National Agricultural Library (NAL) was charged with the responsibility of building and indexing a database of relevant research and knowledge housed at NAL (4hprk Review Committee, 1995). By 1994, it had become apparent that the original taxonomy no longer aligned well with current practice so a review of the taxonomy was conducted, involving the 4-H professional association, USDA and private organizations. to support and guide the advancement of the youth development profession. define a major area of learning appropriate for entry into the profession. volunteerism for youth development: understanding and applying volunteerism knowledge integrated with knowledge of human development, learning strategies, organizational systems and partnerships to develop volunteer management systems and enhance the experiences of unsalaried youth programme staff. The revised taxonomy uses an inclusive approach to support the positive growth and development of young people. It is ecological in that it recognizes relationships between a young person and his or her environment. It is contextual in that it recognizes that young people grow and develop in a wide variety of surroundings and that 4-H youth development practices will vary accordingly. It is relevant for youth development work done through a number of delivery modes. The revised taxonomy rectifies the original taxonomy's shortcomings in preparing people to work with youth. It encompasses areas of work that were omitted from the original taxonomy and addresses emerging new "youth issues" such as substance abuse, early sexual activity, illiteracy, violence, stress and suicide. It reflects the new ways 4-H youth programmes work collaboratively with others who support youth and it is simpler to use as it accommodates content that did not fit into the categories of the old taxonomy or that could be listed in more than one place. The needs of today's young people in developing countries are not very different from those in other parts of the world. They face stress and pressures arising from a number of issues including illiteracy, the need to produce family income, sexual exploitation, sexually transmitted diseases and violence. They are frequently turning to alcohol and other substances as an escape. The transition from traditional to urbanized ways of life means that many of the rural young people who stay in rural areas, as well as those who move to cities, lose their traditional role models and mentors for leadership skills and character development. At the same time traditional institutions are under great stress. Many countries have a variety of government agencies and non-governmental organizations (NGOs) attempting to provide programmes and services for youth. Often these programmes lack coordination, so that there is duplication of effort in some areas and no assistance in others. Programme quality also varies. Local citizens are rarely involved in decision-making or urged to take ownership of the programmes. The environment for youth programmes in developing countries indicates the need for youth development professionals to have knowledge and information that goes far beyond how to grow improved rice varieties and prepare nutritious meals from local food sources. Youth may need these skills today, but even more important are life skills that will serve them well in the changing conditions they will face tomorrow. Communities need youth workers who are skilled in forming coalitions of the various groups serving youth to develop common approaches and shared responsibilities for programming. The involvement of local citizens in the search for solutions to youth issues and the creation of a volunteer leader base needs to be expanded. Thus, the professional research and knowledge base for a developing country may well have content similar to the revised one developed by 4-H in the United States. In a three-day conference from 24 to 27 April 1997, in Poland, national leaders representing 4-H-type programmes in five Eastern European countries endorsed the relevance of the 4-H professional research and knowledge base to their programmes. These leaders from Hungary, Latvia, Poland, Slovakia and Romania made professional research and knowledge bases for youth development education a major objective of the conference. The 4-H PRK base is used in a variety of ways to strengthen the capacity of 4-H organizations to foster positive youth development. It is used as a guide in designing positions for workers who conduct youth programmes. It is also used for designing programmes of study for students who intend to enter the youth development education field and for students wishing to enhance their skills. It provides the basis for evaluating skills and creating in-service training programmes for youth workers. Such a taxonomy provides a framework for classifying, cataloguing and retrieving relevant research and practice information and it assists in identifying a research agenda appropriate to the field of youth development education. These applications of the 4-H PRK base are described in more detail in the following. With the 4-H PRK base as a guide, an organization can describe better the academic courses and/or programmes that will prepare students for the field of youth work. Since the kind of interdisciplinary curriculum required for youth development education is not offered widely by academic institutions at present, the 4-H PRK base can be used to help students to evaluate and choose subjects and electives that will build their competencies in the domains necessary to enter into work in youth development. Agricultural universities in the United States and many other parts of the world offer courses and degrees in human development, education and communications. Many colleges are now offering classes in volunteerism. A few institutions offer programmes for non-profit or youth programme management. The programmes that should be considered by people wishing to become youth development educators include: human development; business administration; communications; community development; sociology; and elementary, secondary and adult education. Classes that build skills in the other competency areas listed in the taxonomy should be added, perhaps as electives, where possible. In the United States, different levels of education are required to work in youth development education. The usual qualification level has been a bachelor's degree. Now, many states require a master's degree for entry into professional positions. In these cases, a degree in human development or education combined with another degree in an interdisciplinary field such as community development can provide the preparation that youth developers need. To fill positions that require a bachelor's degree qualification, many developing nations have followed the precedents set by the originators of 4-H youth programmes in North America and Europe and require degrees in agriculture or home economics. Employing people with degrees of a technical nature often supports the goals of transferring information related to agricultural and home sciences to the younger generation with the intention of reaching adults with this information. Some of this "technical" information is definitely needed by youth in the rural areas of developing countries, especially by young people who are in their upper teens and adult years because they are given access to more resources and are able to make more decisions for themselves. In the United States, however, it was discovered, a generation or more ago, that the above approach was not as relevant to younger people for two main reasons. First, the information in the world is rapidly expanding and becomes outdated in only a few years so that by the time a young person is old enough to make decisions on a farm or in a home, the information learned in the rural youth group is already out of date. Second, many of the young people who grow up in rural areas will spend most of their adult lives off the farm and will often live in a city. Young people in developing countries now live under similar conditions. The solution to this dilemma emerged from the original information transfer-based programme. It was discovered that for many of the youth, the skills learned through the youth programmes' activities persisted far beyond the period when the information was relevant because the skills were transferable to many other situations. These skills have been defined as "life skills" and are now the goal of many youth programmes. Life skills include methods of learning and evaluating information, as well as developing values towards continuous learning. Thus the change in focus - from transferring information to teaching skills experientially - better serves the needs of youth throughout their lifetimes. As these new perspectives on the missions of youth programmes have gained prominence, it has become evident that extension workers need academic preparation beyond scientific training to be effective and address the needs of youth and their families. They need to understand human development and learning strategies for experiential learning. Management skills and the ability to involve volunteers in organizing programmes for youth are required to reach young people in informal settings. These areas of expertise seem as relevant for programmes in developing countries as they have been in the countries where 4-H and similar programmes emerged. 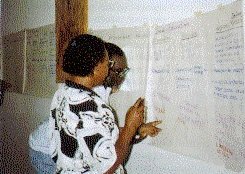 An FAO project with Makerere University in Uganda in 1997 developed prototype undergraduate course plans to achieve these goals. Administrators responsible for youth development programmes can use the 4-H PRK base to design job descriptions that describe the work and the skills needed to do it. This helps administrators to recruit and screen applicants who are best suited for the job. Those who do not understand the complexity of youth education development work often assume that the skills required are "relating well to young people" or "presenting information at a scaled-down level". Neither of these descriptions are accurate if the organization is seeking an educational programme leader who will develop organizational systems, work closely with youth and adult leaders in programme development and administration, design educational methods and materials to teach youth experientially in informal settings and serve as a leader among those working on youth issues in communities. Finding individuals with the skills and temperament for these challenging responsibilities requires much more careful planning than most organizations have given it in the past. The 4-H PRK base gives programme administrators the tools to plan positions better and select people who will be most effective in them. If a youth worker expert is employed, how will the "technical" content be provided? One approach is to arrange for workers with technical knowledge to work with the youth development educator to adapt their content for experiential teaching. This approach allows both types of professionals to be specialized in their fields and contribute to the development of youth. Another approach is ask that the youth development educator has a minor technical qualification in a subject area. This adds another requirement to the long list of competencies sought in youth workers. Most youth development education programmes have a number of professional and para-professional workers responsible for leading programmes at the local, area and central levels. The 4-H PRK base can be very useful in assessing the educational needs of new and current staff. It can also be used to design in-service training. The first step in designing in-service training is to develop a way to assess employees' current levels of skills in each domain. The assessment process could include: interviews, skill assessment stations, self-reporting inventories or on-the-job evaluations. A development plan can then be devised to meet the identified needs. Once competency assessments are completed, training needs in different areas can be identified. Some staff may need training in certain areas, while others need training in others. Leaders in the organization will have to decide which competencies should be addressed. The 4-H PRK base can be used to design classes or workshops that the organization can sponsor in order to target various aspects of the competency area. Individual staff development plans should address the areas that are weakest and are the highest priorities for the job the staff member does. Some needs may be met by the in-service classes the organization offers. For others, the employee may have to take a course offered by someone else or design a self-study project. Other, new competencies may be built as employees undertake new assignments and activities. The 4-H PRK base is very useful in describing specializations of professionals in the field. It helps to define the roles of specialists and clarifies the kind of preparation and additional education they should undertake to build competencies in specific areas. It also makes it easier to assign tasks with the confidence that the employee has the skills and experience to perform them. Several state 4-H programmes in the United States have chosen to use 4-H PRK domains as the basis for describing positions for state 4-H programme specialists. After eight or more years of using this approach, it has been found to work well. The 4-H PRK base can be very useful in storing and retrieving information. Whether developed for informal youth programmes or not, information can be assigned to the appropriate domain and retrieved easily when needed. The kinds of information stored and catalogued could include: research reports, training manuals, lesson plans, model programmes, resource lists, instructions for implementing programmes, marketing pieces, and background materials. These resources will help when making decisions, designing new programmes, implementing programmes and building competencies in staff. In the 1990s the World Wide Web makes it possible to search and retrieve information from anywhere in the world. Soon the headquarters of most youth programmes in developing countries will have the means to access the Internet. A research and knowledge base will help identify keywords to search for useful information quickly and at low cost. The problems faced by youth development staff are areas where research is needed. Sometimes it is difficult to state the problem as a researchable question and to communicate the need to an individual or organization who can do the research. A research and knowledge base can be used to help to identify research needs and solutions to problems when used in the following way; locate the domain that relates to the problem then use the knowledge areas in the domain to define the problem and identify who might have expertise in that particular area. If an organization has the necessary personnel and resources, it could conduct the research itself. The taxonomy will assist in locating similar studies and programmes. A professional research and knowledge base can enhance the quality and status of youth development education programmes wherever they are in the world. A knowledge base helps to design roles for professionals and training for professionals. It can be used to help professionals understand the whole picture of youth development education, it can help communication with other specialists and it can be used to develop respect for the high levels of skills required in this field. What is our youth programme's mission? What skills are needed to prepare today's youth for tomorrow's conditions? What kind of programmes will help young people to develop the skills that they will need? In what environment is our youth programme functioning? What, if any, changes do we expect in the near future? What implications for a research and knowledge base do the changing needs of young people and the organizational situation have for our programme's research and knowledge base? What domains will be comprehensive and yet specific enough to describe the competencies or knowledge needed to deliver high-quality, relevant programmes? 4hprk Review Committee. 1995. 4hprk: a professional research and knowledge taxonomy for 4-H youth development. USA, 4-H.